Project 737 is an Air Niugini initiative that will see a Boeing 737 carry special livery commemorating the 70th Anniversary of Kokoda. Raphael Oimbari, at the Battle of Buna-Gona. Last night the Papua New Guinea Tourism Promotion Authority (PNG TPA) held an event in Sydney to mark the 70th Anniversary of the Kokoda Campaign. The event opened this year’s anniversary trekking season and highlighted the advancements and community developments that have occurred along the track as a result of the legacy of the Campaign and the special relationship between the Fuzzy Wuzzy Angels and the Australian Diggers. special bond forged between the countries 70th years ago and encouraged people to trek Kokoda as the tourism revenue is a key contributor to development for the communities in the region. “Since Australian soldiers left PNG, an estimated 30,000 Australians have returned to trek Kokoda and this has made a huge impact to the local communities aiding development with increased education and health services, creating jobs for porters, guides and guesthouse operators and other small businesses. Many of the local people have built friendships and renewed bonds through tourism development,” Mr Maleva stated. Recent research has estimated that trekkers bring close to a few million Australian dollars a year to the Kokoda area, over time this will add up to significantly more than other, shorter term industries and a much higher proportion of it finds its way directly to the communities. Since 2008 there has been significant investment into improving the Kokoda track and creating a sustainable region and tourism product that will continue to benefit local communities. This work has been led by the Kokoda Initiative, a joint partnership between the PNG and Australian government. The Kokoda Initiative works with a number of key partners in PNG to implement sustainable development programs in the region, including; the Department of Environment and Conservation, Kokoda Track Authority (KTA), AusAID Kokoda Development Programme and the PNG Tourism Promotion Authority. Through the Kokoda Track Authority, trekking fees have been implemented and all tour operators must be licensed. Over 25% of the trekking fees go back into the local community and contribute to improving the development of local communities along the Track. Revenue from trekking permits has given over AUD$270,000 to the local communities since 2009 and over 1,000 local people from the surrounding region have jobs thanks to tourism along the Kokoda Track. There are a number of key events to mark the anniversary this year and the Kokoda Track Authority is holding a number of events for local communities to commemorate significant dates of the campaign. These events will kick off on July 29 with an event at Sogeri where the Kokoda campaign started 70 years ago. There will also be events at Isurava village, Brigade Hill, Iorabaiwa village, Eora Creek and an event in Kokoda on November 2 to celebrate Fuzzy Wuzzy Angels Day. Air Niugini will also be transforming one of its Boeing 737s this year into a Kokoda ‘flying billboard’ with a map of the Owen Stanley Ranges, where the Kokoda campaign was fought, emblazoned on the side of the aircraft to mark the important anniversary. The aircraft will create unprecedented awareness for Papua New Guinea and Kokoda as it travels to Sydney, Brisbane and other ports within the Asia- Pacific region and it is expected to be launched later this year. the trek and in turn contribute to the communities along it. Get yourself to Expo 2012 Yeosu in Korea from 12 May to 12 August this year with newly released travel packages and expand your mind at the Expo. Expo 2012 Yeosu is one of the largest events in the Asian region this year and is expected to draw eight million visitors. One hundred countries will join the exhibition including an Australian pavilion. Expo 2012 Yeosu is an international exposition centred on the theme of 'The Living Ocean and Coast'. It will contribute to finding a brighter future for humankind by highlighting the importance of achieving co-prosperity of the sea and humans and provide the vision for building a green economy that keeps the ocean healthy through clean technologies. It will also be a culturally stimulating expo offering a series of inspiring programs with over four hundred programs and 8,000 cultural performances taking place over the entire ninety-three day period. It will feature large-scale events such as the state-of-the-art night multi-media show, world class performances and concerts of popular singers from Korea and around the world. For Australians wishing to visit Korea for Expo 2012 CTS Tours have released three fully inclusive packages including return airfares to Korea with Cathay Pacific Airways. CTS Tours have three 'Free and Easy Tour' packages starting at $2,300 for a six day/five night tour program visiting Seoul, the capital of Korea and travel to Expo 2012 Yeosu for two days by the super-fast KTX train from Seoul. This package includes return airfares on Cathay Pacific, 5 nights hotel twin share accommodation with daily breakfast, KAL return bus transfers Incheon Airport to Seoul, full day Seoul city sightseeing tour, tickets to Expo 2012 Yeosu for two days and the return KTX train travel between Seoul and Yeosu. CTS Tours are also offering a seven day/six nights tour including Seoul, Yeosu and side-visit to Gwangju city from $2,680 and a seven day/six night tour including Seoul Yeosu Expo and side trip to Busan, the seaport on the south east coast of Korea from $2,680. Legend Asia have land only three day/2night Expo 2012 Yeosu packages from $380 per person twin share including return KTX Express train ticket Seoul-Gwangju with free shuttle bus between Gwangju city and Yeosu plus two nights accommodation with daily breakfast (twin share) including Expo 2012 admission for two days. Smile Travel have three day (land only) packages to Yeosu 2012 Expo starting from $299 per person twin share for motel accommodation in Yeosu city or Suncheon or from $299 per person twin share for 4* hotel in Gwangju city and utilising the free shuttle bus from Gwangju to Expo 2012 Yeosu. The Qantas Group's announcement that it will launch a new Jetstar low-cost carrier out of Hong Kong with China Eastern Airlines is further proof that Asia is a major key to the future of Queensland's tourism industry, Tourism Queensland CEO Anthony Hayes said today. Mr Hayes said the announcement by the Qantas Group was fantastic news for the state's tourism industry given Asia had the greatest tourism growth potential for Queensland, particularly China which continued to experience an increase in visitors. "I understand that subject to regulatory approval, Jetstar Hong Kong will service short-haul routes in Asia from 2013 including Greater China, Japan, South Korea and South East Asia," Mr Hayes said. "These markets are important to Queensland and it's great news that there will be more options for travellers to fly within Asia on Jetstar Hong Kong and catch a connecting flight to Queensland directly or via another Australian gateway." Mr Hayes said in 2011 Queensland had welcomed over 680,000 Asian tourists. "This is 36 percent of all international visitors to Queensland," he said. "Asian tourists spent $1.5 billion while on their trips to the state. "Some of our Asian markets are growing steadily, particularly China, and it's important that initiatives like these continue to take place to capture a bigger slice of the international tourism pie." The Government of Fiji has this week extended an invitation RFT from accredited firms for the production of a Tourism Development Plan for Fiji for the period 2013-2017. The RFT requires that Fiji’s next five-year tourism development plan be firmly based on infrastructure development strategies and plans. This focus is critical due Fiji’s limited resources and its need to optimize and effectively coordinate development initiatives. - A statement that the proposal is valid for 90 days. Deadline for receipt of submission is before 2.30pm Wednesday, 11 April 2012 Fiji time. Racing enthusiasts are set to flock to Peru in early 2013, with the news that Lima will host the start of the famous Dakar Rally on 05 January 2013. Adventurous Aussie travellers who want to witness the start of this adrenalin-filled event are urged to organise their travel to Peru now, to ensure they catch the start of the world's most exciting off-road rally. 2013 marks the 35th year the race has been held in South America and the second year Peru has been on the race path. The participants will race out of Lima and through Peru's southern coast into Chile then onto Argentina. Over a billion people from 190 countries are expected to watch as the race unravels. PromPeru's coordinator for Asia Pacific, Rosana Guinea, urges Australians to book a trip to witness this event and experience the festival atmosphere first hand in Lima at the start of the race. "Lima and Peru will come alive during the Dakar Rally next year and it is a fantastic time for visitors to experience the city. We are thrilled that Peru has been chosen as the host country to start this renowned race and this signifies that the country is able and equipped to host large scale events for the world to see." According to Peru's Minister of Foreign Trade and Tourism, José Luis Silva Martinot, Peru's participation in the 2012 Dakar Rally generated over US$520 million directly and indirectly, with the most economic impact coming from hotels and petrol stations. Marking 22 years of hospitality in Sydney's most sought after waterfront location, Park Hyatt Sydney has revealed a spectacular rebuilt residence, pairing an unrivalled location with an unrivalled hotel. To dramatically transform Sydney's harbour front, Park Hyatt Sydney closed its rooms, spa, restaurant and bars for most of 2011 to undergo a complete rebuild. Park Hyatt Sydney now features three rooftop suites built on a new fourth level. This new level boasts just shy of 360-degree views spanning Sydney's iconic Sydney Harbour, the Opera House and Harbour Bridge, and includes the city's largest suite, the Sydney Suite at 350 square meters, offering the most discerning guest Sydney's absolute finest. Importantly Park Hyatt Sydney honours its heritage by ensuring original Sydney Sandstone and local woods were incorporated in the rebuild. The hotel has commissioned a number of Australian artists including sculptors, painters and photographers for artworks designed especially for the new hotel. The 21 years that Park Hyatt Sydney have called their Circular Quay pier home is respected and celebrated throughout the hotels' redesign. Australian hotel design firm, BARstudio, has created a new intimate and stylish interior, featuring an art gallery of interior pieces, including artefacts, books and artworks on the bedroom shelves and walls in all 155 bedrooms, and unique items throughout the hotel. Floor-to-ceiling glass doors open onto spacious private balconies for most guestrooms, which no other accommodation in Sydney provides. Custom-designed lighting and new natural tone furnishings and fixtures enhance the indoor-outdoor lifestyle that Park Hyatt Sydney observes. The new restaurant, The Dining Room, is led by Australian born chef, Andrew McKee, who brings with him a fundamental appreciation of the premium quality of Australian produce. Offering guests his authentically inspired cuisine, sourced from specialty local farmers and fisherman, his meals can be enjoyed while relishing the clean air and sunshine from one of the guest room balconies or open dining areas, making a uniquely Australian experience. Park Hyatt Sydney's general manager, Andrew Mensforth, stated, "Park Hyatt Sydney has completed the rebuild of this fine property, and we are delighted to announce we have reopened. Having undertaken a total rebuild, with only the external walls remaining, we look forward to showcasing the new hotel to our discerning local and international guests". Emerging from a dramatic transformation, the newly redesigned Park Hyatt Sydney brings a new level of contemporary luxury to the edge of Sydney Harbour. With a coveted harbourfront location between the world-famous Opera House and Sydney Harbour Bridge, Park Hyatt Sydney offers guests an intimate, residential-style hotel with architecture, design and art that reflects the Australian landscape. Three new rooftop suites, including the exclusive Sydney Suite with near 360 degree panoramic views of Sydney Harbour and a private outdoor terrace, cater for the most discerning traveller. Qantas chief executive Alan Joyce has opened up on being gay, having cancer and his $5 million salary, in a revealing interview with a men's magazine. Joyce has spoken to GQ magazine about revealing to his family that he was gay, and being treated for prostate cancer last year,The Australian newspaper reported in a preview of the magazine article. Joyce also defended his $5 million salary, saying pilots are paid more on an hourly basis. Joyce has shared his life with a New Zealand man since 1999. He talks about the difficulties of growing up gay in Dublin, where his mother was a cleaner and his father worked in a tobacco factory. In the wide-ranging interview for the April issue of GQ, Joyce says he is paid less to run Qantas than he was to run budget airline Jetstar five years ago. "What Qantas pays me as CEO is actually very conservative compared with other ASX 100 companies, and if you ranked salaries by hours worked I'm not even the highest paid person in Qantas because the pilots and senior captains get paid a lot more," Joyce says in the article. In the interview he also admits to making crucial mistakes in his career, including setting up Jetstar without assigned seating. Set in over 150 acres of tea plantations and nature, the award-winning Fuchun Resort, nestled among picturesque hills and tea terraces in Hangzhou, China, has launched a new package offering luxurious tea-infused retreats to this idyllic location in the shadow of the Fuyang Mountain. Combining picking the famous Longjing tea that is local to the area, tea-based massage treatments and tea sets overlooking the Resort's peaceful lake, the Tea Retreat Package is available from April 1st onwards, right at the beginning of the tea-picking season. 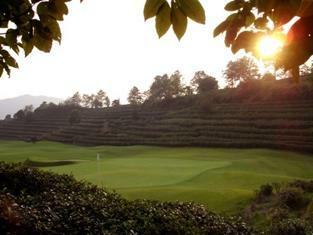 The launch of the package coincides with the Qing Ming Festival holiday that arrives on April 2-4, marking the annual start of the tea-picking season in and around Fuchun Resort Golf Course. The season goes all the way from Spring 'till Summer each year. It is in April that the tips of the Longjing tea leaves are at their most tender. The one and two-night stay Tea Retreat packages not only provide luxury accommodation on one of Fuchun Resort's 41 suites, but also the opportunity for residents to head out into the depths of the resort to pick their own Longjing tea leaves. 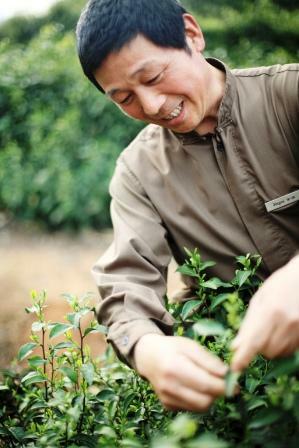 Best picked just after the sun has risen over the lake at the resort, residents join Fuchun Resort's very own Tea Master in the tea plantations. After spending over an hour in the plantations collecting the tea leaves, residents will join the Tea Master in pan-frying the leaves to halt the oxidization process so that the leaves maintain their natural flavor as much as possible. 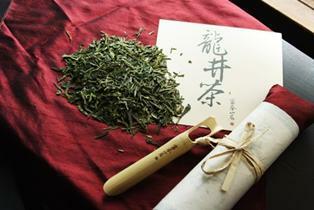 The Tea Master then creates a fully packaged Fuchun Resort branded bag of tea leaves for the residents to take home. Longjing is considered the crème de la crème of green teas for its leaves' very tight and flat shape, with a light green color. The leaves are very delicate and somewhat uniform in their appearance, therefore maintaining the high quality and consistency that Fuchun Resort's tea has become associated with. The health benefits from drinking Longjing tea are wide ranging, and due to the minimum preparation of the leaves prior to drinking, the leaves' contain beneficial antioxidants that help cleanse the body. In fact, it is said that one cup of white tea contains approximately 12 times as many antioxidants as a glass of fresh orange juice. With the health benefits in mind, the Tea Retreat package also offers residents the chance to enjoy a 60-minute Himalayan yoga session with Indian Yoga Master Yogacharya Gireesananda, who boasts 25 years of experience around the world. As an option instead of yoga, residents can choose the Dragon Well Foot Treatment at the award-winning Fuchun Spa. Using the Longjing tea picked from within the vast resort, Fuchun Spa's 60-minute signature Dragon Well Foot Treatment has become one of the Spa's signature treatments. The Longjing tea helps to detoxify the skin in the feet and creates an invigorating feeling through the five stages of the treatment. First the feet are soaked in tea-infused warm water, before the fresh Longjing tea leaves are combined with mint and lime for a cleansing scrub that clears bacteria, removes dead skin and opens the pores of the feet to fully absorb the essence of the tea leaves. This is followed by a Sea and Epsom Salt rub that helps relax the feet before a massage and essential oils with peppermint and lemon are worked into the feet to offer a cooling and refreshing finish. 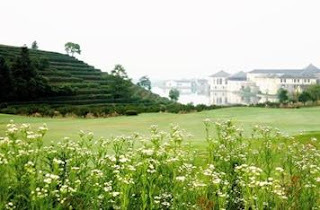 Consistently recognized as one of China and Asia's leading resorts and spas, Fuchun Resort is nestled among the lush, tea-covered hills in Fuyang, Hangzhou, two and a half hours from Shanghai. Hidden along the banks of the Fuchun River, the resort is situated in over 150 acres of private land, and is home to a luxury resort hotel, 17 private villas, a Spa and an exclusive golf club. A member of both Leading Hotels of the World and Leading Spas, Fuchun Resort has won numerous prestigious awards including the 2011 World Travel Awards for Asia's Leading Luxury Golf Resort, Asia's Leading Villa and China's Leading Resort. Roomorama is a leading online short-term rental platform, catering to a new breed of savvy travellers and business professionals who appreciate a better alternative to hotels and serviced apartments. From its database of more than 30,000 properties in over 500 destinations, Roomorama provides access to any kind of property you want, whether it is a cosy studio in Paris, a trendy loft in New York or a luxury villa in Bali. Since its humble beginnings in New York City, Roomorama has grown quickly, expanding from representing properties in major US cities, to properties across Europe and now worldwide. Offering a diverse selection of properties ranging from individually-owned homes to managed properties, the site offers 24/7 customer service and listings are completely free of charge and commission-free. Roomorama isn't just about the accommodation, it does everything in its capacity to make you feel and live like a true local, enjoying a 'home away from home'. Founders Jia En Teo and Federico Folcia started Roomorama when they discovered they could subsidise their travels by renting out their own apartment. In the process they found like-minded friendly people with the same desire to experience a destination by living locally. Virgin America, Virgin Atlantic Airways and Virgin Australia have just announced the further integration of their frequent flyer programs, which will now allow members to redeem miles or points when taking flights on any of their sister-branded airlines across their respective route networks. The move builds on the previous arrangement launched in 2010 which enabled points earning across the Virgin family but didn't offer inter-carrier redemptions. Virgin Australia ceo John Borghetti said "A good frequent flyer program remains one of the key drivers for customers globally when choosing an airline. One of the most important features for our frequent flyers is the ability to earn and redeem points and enjoy status privileges wherever they fly, and we are pleased to offer our guests the opportunity with leading airlines such as Virgin America and Virgin Atlantic". The move is effective immediately, with a statement touting the new ability for members of Virgin America's Elevate program and Virgin Atlantic's Flying Club to redeem flights on Virgin Australia from Sydney to Los Angeles. DEFENCE Minister Stephen Smith's push to buy a giant high-speed navy catamaran capable of carrying more than 300 troops to a disaster zone or regional conflict has been quietly shelved. Mr Smith ordered Defence to investigate the potential purchase of a fast catamaran last year to ensure there was no repeat of the Cyclone Yasi debacle, when navy did not have any amphibious ships available to assist in the clean-up from the February 2011 disaster. The 100m fast catamaran would have given the navy the ability to move troops and vehicles at a speed of about 35 knots to a range of up to 1500km. 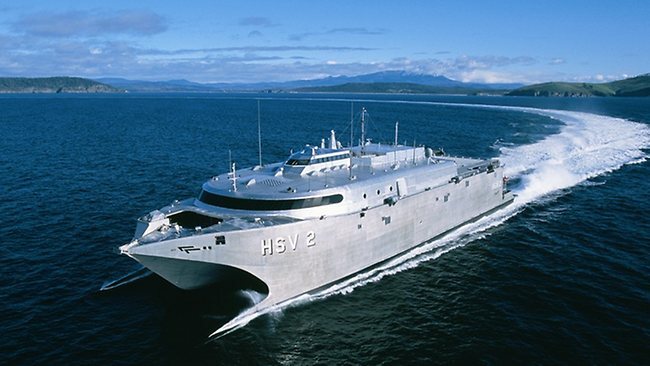 It would also have been a major boost to local shipbuilders, Incat in Hobart or Austal in Mr Smith's home town of Perth, which both produce large high-speed catamarans for the US navy. Checked baggage allowances will be based on the number of pieces checked in rather than the total weight. A maximum of three pieces of baggage may be pre-purchased online or via the Guest Contact Centre at a discounted rate, including any complimentary allowances. Baggage may also be purchased at the airport at a higher rate. There will be a small flat fee for overweight baggage, rather than charging per kilogram for overweight baggage. All information included above is correct as at 19 March 2012. The baggage policy is subject to change, please refer to the website for further information regarding the new baggage policy. Following the announcement of the iconic Cradle Mountain Lodge in Tasmania joining the Peppers network last week, the luxury boutique brand was pleased to officially unveil the Peppers sign at the newest addition to its New Zealand network - Peppers Parahua Martinborough. 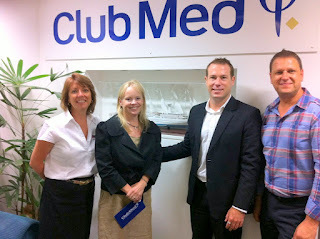 Pictured are the retreat's owners and Mantra Group executives toasting good health to the new partnership. Peppers Parahua Martinborough offers a range of 28 cottages and villa style accommodation in New Zealand's emerging Martinborough wine region, less than 1½ hours drive from Wellington. It is the fifth property in the Peppers network, joining Peppers on the Point Rotorua in the North Island and Peppers Clearwater Resort Christchurch, Peppers Lake Tekapo Resort and Peppers Beacon Queenstown in the South Island. There are 26 Peppers Retreats, Resorts and Hotels across Australia and New Zealand with further additions planned for 2012. Hosted Accommodation Australia, the national peak organisation representing owner operated, quality hosted accommodation today announces the launch of new corporate and consumer websites. The organisation's key role is to encourage and support small to medium accommodation businesses to provide an exceptional accommodation experience. The new corporate website is packed with useful information for newcomers who are developing a business, online marketing initiatives for experienced operators, advice on selling or purchasing a business, links to the latest tourism research data and the ability for comment on current issues. Membership of Hosted Accommodation Australia enables secure access to numerous other resources including an active members' blog, exclusive discounts and management fact sheets. The new consumer website is unique in Australia as it is the only national website specific to this industry to exclusively list quality assured accommodation. Only business owners whose accommodation and service meet the quality standards required by Hosted Accommodation Australia are admitted to membership. Listings on the consumer website include bed and breakfasts, farmstays, guesthouses, self catering cottages, houses and apartments. As distinct from holiday houses and serviced apartments, member properties are required to provide exceptional service and hosting commensurate with the type of accommodation the clients have selected. Website visitors can view in depth information for each member property including multiple images, guest reviews and a map, as well as relevant regional and state/territory information. Both websites utilise the latest technology and an increasing number of members offer a 'Book and Pay Online' facility. 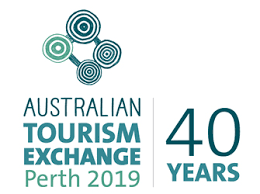 Hosted Accommodation Australia's Chairman, Ciaran Cryan is confident that the new websites showcase this important sector of the tourism industry. "They will provide both domestic and international consumers with choices in superb accommodation and give our members the effective support they need to manage and promote their businesses. Mantra Ettalong Beach has joined forces with Central Coast Tourism in a $40,000 cooperative marketing campaign aimed to drive more visitors to the region. Central Coast Tourism CEO Oliver Philpot said the campaign will showcase the region as an ideal location to 'live life to the fullest on New South Wales' Central Coast'. "It also highlights the accessibility of the Central Coast, just one hour north of Sydney and south of Newcastle, providing visitors with more time to enjoy their holiday and less time on the road travelling to the destination," said Mr Philpot. 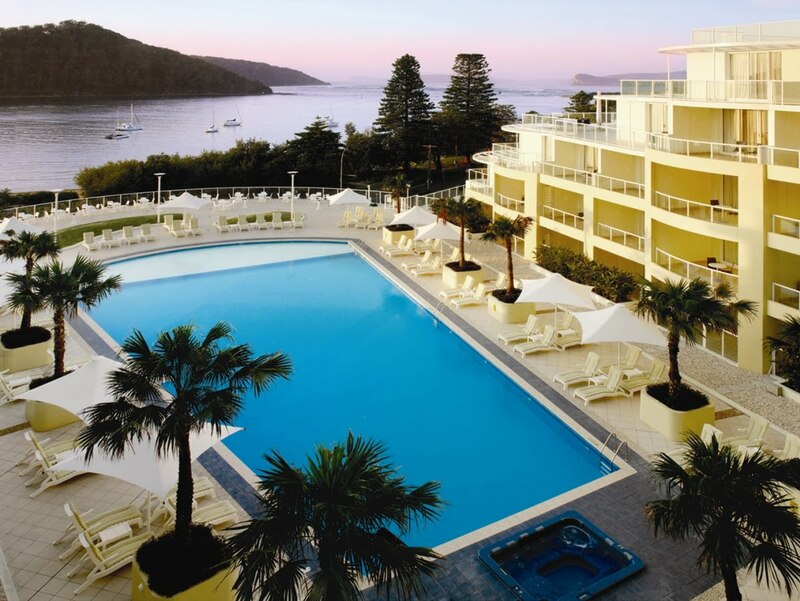 The campaign will target visitors from Sydney and Newcastle, highlighting short breaks at Mantra Ettalong Beach until October 2012. To kick off the campaign, Mantra Ettalong Beach is offering the chance to escape the hustle and bustle of the city and escape to the coast on a two night deal from $146* per night in a One Bedroom Apartment with hinterland views. Call 13 15 17 or visit www.mantra.com.au or www.getoutofsydney.com.au. 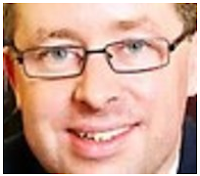 Mantra Group Marketing Director Ken Minnikin said the aim of the joint marketing campaign is to build the tourism business for the region by implementing an integrated marketing campaign utilising print, radio and digital marketing activities. "This will benefit everyone who lives and works in the Central Coast region," said Mr Minnikin. "This dual commitment also highlights a unified approach to the future of tourism in the region and shows the mutual support between Mantra and Central Coast Tourism." Located on the shores of Ettalong Beach, Mantra Ettalong Beach offers access to the surrounding unspoilt beaches and secluded bays, and the Brisbane Waterway and National Parks are just a short drive away. The resort boasts a selection of accommodation options including studio rooms, self-contained one and two bedroom apartments and three bedroom penthouses. All rooms feature glass doors opening onto balconies, designed to take advantage of the panoramic coastal and hinterland views. The campaign is supported by Destination NSW through its Regional Tourism Partnership Program. *Subject to availability. Valid until 7 October, 2012. Two night minimum stay applies. 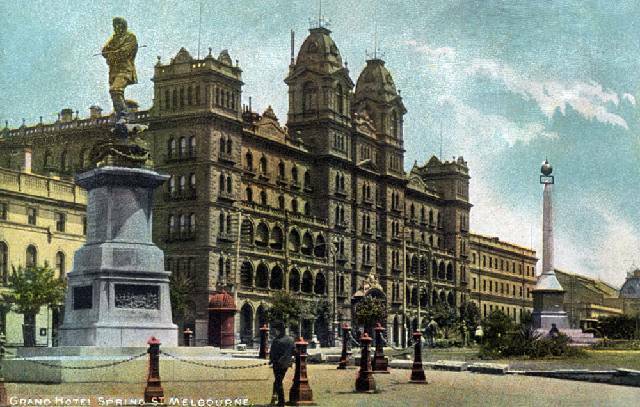 Melbourne's Hotel Windsor is asking people to share their memories and memorabilia of the famous hotel, from valet parking receipts to special menus, to help it build an archive that will preserve and celebrate the building's history and the changes in fashions and social trends it has witnessed. For decades, the Hotel Windsor has been Melbourne's choice for special family celebrations, weddings, romantic trysts, and social and business functions. Now, on the eve of its 130th anniversary in 2013, the hotel is keen to ensure these moments live on for future generations. "The Hotel Windsor has been an integral part of the fabric of Melbourne for almost 130 years," Victoria Batters, Hotel Windsor marketing manager, said. "The history of the building, its design and development over the decades, has been thoroughly documented but there is a lot of social and cultural history that is missing. This is what we want to gather and collate, for our own records and to share with Melbourne." The hotel is particularly interested in receiving photographs, videos and records of weddings at the hotel, as a barometer of changing social trends. But any records and recollections of an event will be welcome, as the hotel prepares to celebrate its 130th anniversary ahead of many of the world's leading grand hotels including the Savoy in London and the Ritz Paris. "We're looking for items such as menus people may have taken as a souvenir, invitations to a special event or dinner, valet parking tickets, and, of course, photographs that perhaps show the fashions of a particular time or aspects of the hotel," Ms Batters said. "We'd also be grateful for any written recollections of a special event such as a wedding or anniversary and memories of Melbourne and the hotel at the time." The hotel is asking for memorabilia to be donated if possible, but otherwise is happy to take copies of materials submitted and return the originals. "Materials will be used as part of displays for the public and to up-date our historical files and records," Ms Batters said. "It will also be useful for media, who often ask for historic images and anecdotes about the hotel and for online archives. We realize material will be very precious to owners and every item will be treated with the utmost care. "The hotel hosts around 70 weddings every year so we're estimating there have been about 3,500 wedding receptions here in just the last 50 years, and at least as many events, ranging from fashion shows to book launches and business conferences. It would be wonderful to compile a visual and written record of all of this." The names of people who submit information will go in to a lucky draw to win an accommodation package at the hotel. And any particularly special highlights will win their owner an afternoon tea for two, at the discretion of the hotel. The 180-room Hotel Windsor was built in 1883, pre-dating some of the world's leading grand hotels including the Savoy in London, which was built in 1889, the Waldorf Astoria in New York which dates back to 1893, and the Ritz Paris which opened in 1898. Adelaide, as anyone knows, is a quirky town. Established in 1836 by British free settlers, the city was beautifully designed and laid out by Colonel William Light with a foresight that South Australians enjoy to this day. The quirkiness extends into numerous facets of Adelaide life and one of the most obvious is their extremes of architectural design. Early photos of the city show ornate Victorian and Edwardian buildings styled in rich, locally-hewn sandstone. Over the years many of these noble buildings have vanished, to be replaced by enormous glass, metal and marble monoliths of dubious aesthetic value. It is quite common to see surviving examples flanked by these “modern” monstrosities. 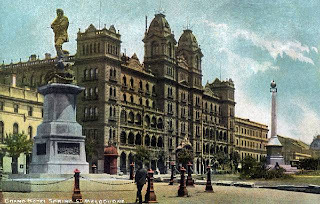 The centre of the city is Victoria Square, bordered by this awkward dichotomy of old and new, is presided over by some of the city’s best known classic buildings; the GPO, the courthouse, the former Moore’s department store and the old treasury building. In 2002 Toga Hospitality chose the Medina Serviced apartment brand to complete their total renovation of this very early, almost derelict Adelaide civic landmark, creating one of the most innovative and stylish serviced apartment projects anywhere. In 2004 it scooped the category at the HM Awards and garnered a UNESCO citation in 2003. Finally I have the chance to experience this magnificent property, respectfully and tastefully restored right down to the original Premier’s Cabinet Room, courtyard garden and secret underground tunnels. Guided by long-serving reservations manager, Kasha Adams, newly installed GM, Ben Lancken and I tour the former corridors of power. Many of the artefacts like coins, cans and cutlery uncovered during restoration work are displayed in cabinets. As for future plans, I asked Toga Director of Brands and Communication, Lisa Phillips, about what Toga have in store for the Medina Grand Adelaide Treasury and the key to developing the unique customer experience. “Over the past 12 months at Medina Grand Adelaide Treasury, we have continued to work hard on delighting each and every guest,” she says. “Our guests lie at the heart of everything we do and we have some wonderful initiatives in place to help us deliver a great experience, every time. “A critical component to enhancing the guest experience is the ongoing training of our Team Members. A reflection of the strength of these systems can be seen at Medina Grand Adelaide Treasury though the high percentage of guests indicating they would recommend the hotel to friends and family and through positive reviews on key listening platforms such Trip Advisor. “The guest experience has also been enhanced through the continuous upgrade of facilities throughout the hotel including the installation of brand new televisions throughout in 2010. We look forward to maintaining and improving on the strong performance of this hotel into 2011 and beyond. 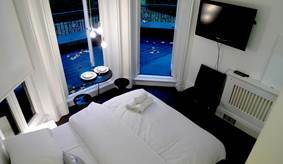 “Medina Grand Adelaide Treasury is a beautiful hotel, a jewel in the Toga crown. One of our priorities when it comes to this hotel is to maintaining the integrity of the building, both inside and out, rather than making dramatic alterations due to its historical importance. “In order to do so, we will continue to roll out an ongoing upkeep schedule whilst working with our interior design team to constantly find new ways to showcase the hidden treasures and unique features of this hotel,” she says. Developments of this scale and integrity are rare in Australia, especially in a CBD, with other examples like the Henry Jones Art Hotel in Hobart and Rothbury On Ann in Brisbane some of the few worthy contemporaries in this category. With business and meeting facilities, restaurant and bar plus unusual function space, Medina Grand Adelaide Treasury is a beacon of taste and style in a sometimes confused city. Starting a world-standard eco-resort from scratch is no easy feat, but Mataking Island (Pulau Mataking) in the Celebes Sea to the East of Sabah is an example of how to go about it. Ten years ago the palm oil tycoon, David Sie, identified a lonely, forlorn island as a potential site for a reef and dive resort. Only problem was the island was awash with garbage, the reefs were “bombed to hell” by illegal fishermen and the turtles had vanished because their nests were continually raided. Mataking Island is located in an area of the world called the ‘Coral Triangle’ where fish and coral diversity outstrips both the Great Barrier Reef and the Caribbean put together. Luke goes on to tell me that 24 armed guards regularly patrol the waters off the island as part of their “enforcement” of fishing and dumping laws, but also stresses that “education” is their strongest weapon. “Our 25 landscaping staff still collect over 50kg of plastic and rubbish off our beaches every day, but we are slowly educating the villages on neighbouring islands to stop throwing everything into the sea,” Cox said. Every year the resort holds what it calls “reef day” and brings hundreds of local Bajau kids from the islands to the reef, gives them a T-shirt and a diving mask. The resort also works with the WWF on a turtle breeding program. Freshly laid nests are relocated to a secure area at the resort to be allowed to hatch in safety. Hatchlings are then released by guests at 6.30pm and allowed to make their trademark frantic race to the surf unmolested by predators. The project is both an attraction and a tangible conservation effort. 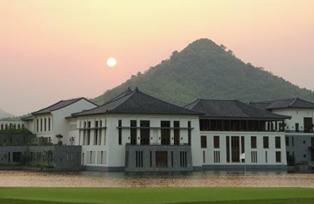 Currently the resort has just 37 rooms with a plan to expand to a sustainable maximum of 50. Most guests arrive from the EU for peak season, although Australian and Asian markets are booming, particularly China (up 270%). Diving is offered to PADI 5-star standard at over 30 sites around the reef including a 52-foot steel cruiser sunk as an artificial reef. Turtles, rays, reef fish and bright corals abound in this delicate ecosystem in a benchmark ecologically sustainable resort project that is part of a wider, growing consciousness in Malaysian Borneo. Do I cruise the Caribbean or do I cruise the Mediterranean – that is the question facing MTA - Mobile Travel Agents' Jo Oldfield who has been named the winner of a $50,000 'Trip of a lifetime' cruise aboard Club Med 2. Jo scored the all-inclusive cruise for two as part of a recent national sales incentive offering the opportunity to win $50,000 of Club Med Travel. Her prize includes all accommodation, all meals, all drinks, sporting activities and entertainment while on board the magnificent 637-foot, five-masted sailing ship. 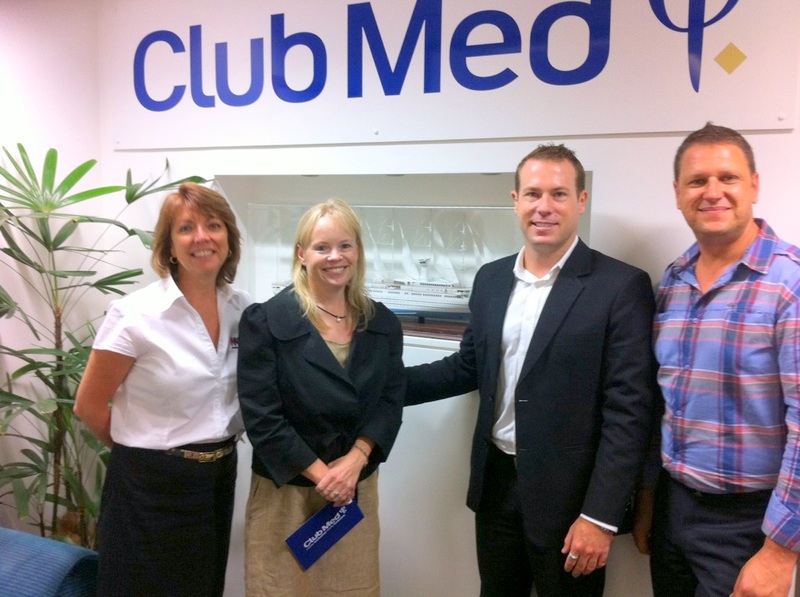 Jo (second from left) is pictured receiving her receiving her prize from Club Med National Sales Manager, Marc Letourneau (third from left). Also pictured (on left) MTA Business Development Manager – New South Wales, Jackie Pennock and (far right) Club Med Business Development Manager – New South Wales, Adam Ferraro. Government tourism authorities in Thailand are cracking down on hotel safety after the deaths in a fire last week of two Russians, a woman in her 30s and a 47-year-old male. 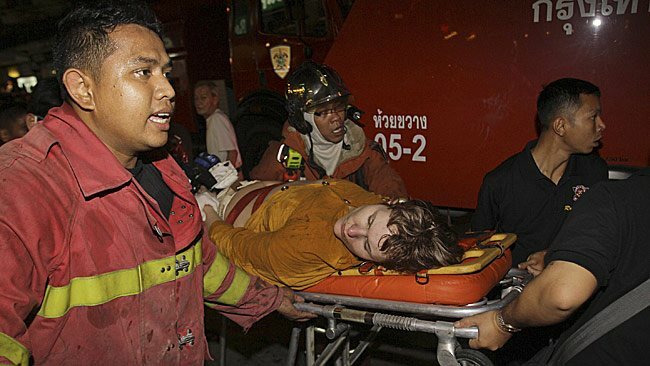 The fire at the Grand Park Avenue Hotel, located on Sukhumvit Road Soi 22, also resulted in injuries to 20 domestic and international tourists, most of whom have now been discharged from hospital. Thailand's sports and tourism ministry is recommending that all hotels built before 1992 install water sprinklers throughout their properties, although there is no legal requirement for them to do so. TTR Daily in Bangkok said privately major inbound tour operators from Europe have been urging hotels to comply with stricter fire precaution measures for some time, well beyond what is stipulated in building codes and laws. Some make it a prerequisite for gaining contract business. Tour operators insist on higher standards for their clients due to liability under European law to ensure hotels used by their holiday customers meet certain safety conditions. Thai authorities are promising a new crackdown, targeting hotels that have deliberately ignored fire and safety regulations. Tasmania's list of exceptional new tourism offerings continues to grow after the state's historic win at the prestigious Qantas Australian Tourism Awards on Friday 2 March. An array of exciting new travel experiences are now available for visitors, from seaplane tours with Tasmanian Air Adventures, to thrilling mountain biking daytrips with Vertigo Mountain Biking. The Tasmanian Wild Abalone Tour combines adventure with dining, while those seeking a more sedate epicurean experience can be content sampling cheeses and wine at the new Wicked Cheese Co. tasting house and Josef Chromy winery respectively. The island's convict past is explored in a new play entitled "Her Story" at the Cascades Female Factory, and indulgent accommodation awaits at the recently revamped 2 on 2 and new Dragonfly Lodge. Tasmanian Air Adventures (TAA) has just released three exciting new sea plane adventures that showcase Tasmania's natural beauty. Departing from Hobart's picturesque waterfront, guests can choose from one of three scenic flights - a Hobart, Mt Wellington and Port Arthur experience (Wild Capes Air Adventure); a journey over the striking tannin-stained waters of the Gordon River and Tasmania's iconic World Heritage Wilderness; or an aerial expedition over the aqua blue seas and white sands of the Freycinet Peninsula and Wineglass Bay. The planes land at each of the locations, allowing guests to disembark and walk along secluded beaches, through ancient forests and past waterfalls. Tasmanian Air Adventures also offers transfers to MONA, Saffire, Freycinet, Port Arthur and Cradle Mountain. Prices range from $99 to $399 depending on the experience. Only an hour and a half from Hobart and Launceston, the luxurious and secluded Dragonfly Lodge sits in Rocky Hills on the East Coast of Tasmania facing the stunning Great Oyster Bay and Freycinet Peninsula. The stunning property features Chinese and Mongolian décor in the spacious living area, three lavish bedrooms with king beds, breakfast and pantry provisions, a double sided open fireplace, a telescope to spot local wildlife with and a fully stocked library of books, CDs and DVDs. Excellent wineries and restaurants and leisurely walks are within close proximity and the striking views offer a relaxed backdrop for those wishing to unwind. Dragonfly Lodge can accommodate up to six people and costs $780 per night (minimum of two nights per booking). Boutique cheese makers, The Wicked Cheese Co have set up a new tasting house in the historic town of Richmond, just 25 minutes from Hobart. Visitors can watch cheese being made through windows to the production area, enjoy a light snack or lunch at the licensed café, taste and purchase Wicked Cheese's delectable offerings at factory prices, and peruse a range of other Tasmanian cheese and gourmet products, including locally grown and produced olive oil, Tasmanian Whisky (used in Wicked Cheese's Marinated Whisky Cheddar), and locally produced fruit pastes. Wicked Cheese was founded by cheese making connoisseur, Ashley McCoy, who uses the purest hormone and chemical free milks from grass-fed cows in his traditional French recipes. Famed winemakers Josef Chromy have built a striking new state of the art winery on their stunning 61 hectare (150 acre) vineyard and estate, where their acclaimed wines are produced from premium cool climate fruit. Pinot Gris, Sauvignon Blanc, Chardonnay, Riesling, Gewurtz Traminer, Pinot Noir, a sparkling wine and Botrytis Riesling are just some of the wine varieties created by Josef Chromy, which can be tasted at the Josef Chromy Cellar Door and Café located in the estate's original 1880s homestead. The cooler months are a good time to visit, with an open log fire and views of the surrounding vineyards and landscaped gardens making the homestead a welcome place to linger over lunch. The menu offers light lunches, gourmet platters, and the Chef's seasonal specialties paired with estate grown wines. Josef Chromy is 15 minutes drive south from Launceston. Located a gentle five minutes stroll away from Hobart, 2on2 are two fully-self contained 1880 Victorian townhouses with contemporary interiors and all the modern luxuries expected by today's traveller. The 3-bedroom 'Big One' features a chic palette of black, red and white, with a generous open-plan lounge, kitchen with stainless steel appliances, deck with spa and water views. The 1-bedroom 'Little One' has a palette of aubergine, burnt orange and stained wood with views of the garden maze, a smart, sun-filled living area, a modern kitchen and a private deck. Mid-week prices start from $275 a night and include a complimentary breakfast hamper on arrival. "Her Story" is a brand new experience for visitors to the UNESCO World Heritage listed Cascades Female Factory in South Hobart -Australia's most significant site associated with female convicts. Sitting in the shadow of Mount Wellington, The Cascades Female Factory once held up to 1,000 women, children and babies at a time. "Her Story" is a powerful theatrical portrayal of the difficult life these women experienced, and centres on Yard One, following the arrival of the transportation ship Frances Charlotte in 1833. This fascinating play vividly brings to life the conditions these women experienced and is staged at 11am daily. Travellers can fly to Tasmania on Jetstar, Virgin Blue, Qantas, or Rex Airlines, or take the Spirit of Tasmania ferry from Port Melbourne (VIC) to Devonport (TAS). Xi'an is known primarily as China's ancient capital. The city reached its most glorious period during the Tang Dynasty. Today, flocks of tourist visit the city's many historical sites. However, the most vibrant and colorful part of the city is undoubtedly the Muslim District. Xi'an's Muslim Quarter is populated largely by Hui people one of China's largest ethnic minority groups. Wandering the Muslim Quarter, you will see baskets piled high with dates alongside Halal butcher shops and stuffed fried bread buns. The small streets and alleyways of this district come alive at night when vendors and shop owners hawk their wares, bikes fly between shoppers, and the smell of delicious Hui street snacks fills the air. The highlight of the Muslim Quarter is a visit to the Grand Mosque. Built during the Tang Dynasty, this house of worship is still in use today. The mosque is designed in the Chinese style with four courtyards and landscaped gardens. The Grand Mosque is considered to be one of the largest and best-preserved mosques in the country. Mobile Travel Agents' brand to a truly national – and international - audience next month, MTA Brand Ambassador Jessica Watson and fellow Australian sailing legend Bruce Arms will join forces to crew the specially branded yacht 'Mobile Travel Agents Big Wave Rider' in the 2012 Australian Three Peaks Endurance Race in Tasmania at Easter. There will be no mistaking the vessel with its eye-catching MTA logo taking pride of place on the mainsail and hull as its makes it way from Launceston along the Tasmanian east coast on Good Friday (06 April) with Bruce at the helm and Jessica on this occasion performing normal crew duties. Adding further exposure for the MTA brand, Bruce and Jessica will also address the huge crowd anticipated dockside in Launceston from the deck of 'Mobile Travel Agents Big Wave Rider' before the race gets underway. MTA Managing Director, Roy Merricks will also be involved in the event, organisers having asked him to fire the 10-minute gun at Inspection Head Wharf in Launceston which traditionally marks the official count-down to the start of the race. Internationally recognised Jessica, the youngest person to sail solo, unassisted and non-stop around the world, was officially inducted into the MTA team last November. Mr Merricks said Jess was a perfect fit for the MTA brand and very representative of the company's image. "We are obviously proud to have Jessica on board with MTA – as a young, fresh, invigorating, adventurous and inspiring person she truly embodies and is very representative of our brand and our overall image," he said. "Our involvement with Jessica in the 2012 Australian Three Peaks Endurance Race is just one of several exciting projects we have planned with her across 2012." Bruce Arms is well known for being Jessica's project manager for her historical around the world voyage. He is also the world sailing record holder for a single handed circumnavigation of Australia and has won the trans-Tasman race twice. He is also an Australian Three Peaks veteran having competed in the event twice. "Having both Bruce and Jessica aboard 'Mobile Travel Agents Big Wave Rider' at the same time is a major coup for us and the MTA brand," Mr Merricks said. The Australian Three Peaks Race is a non-stop offshore sailing and endurance mountain running event, commencing at Beauty Point just north of Launceston on the Tamar River and finishing in Hobart on the Derwent River. En route, the running members of each team have to scale Mount Strzelecki, Mount Freycinet and Mount Wellington. The east-coast course around Tasmania affords the best combinations of suitable mountains, coastal centres, accessibility for followers, press crews and the public. It also brings national and international and exposure to two of the more beautiful but remote areas of the state including Flinders Island and the Freycinet Peninsula. For competitors it offers an interesting alternative for the yachting fraternity and a challenging new activity for runners, climbers and bushwalkers. It is this unique combination of the two disparate disciplines which provides for such a challenging event. Pictured: Jessica Watson aboard 'Mobile Travel Agents Big Wave Rider'. A relatively minor incident at Bali’s airport on February 1st has gained international notoriety; details in this week’s update. Development ranks high in this week’s edition with reports on the effects of migration from other areas to Bali; calls for more emphasis on quality before quantity in seeking tourists arrivals; warning on the dangers of mass tourism; and fears of severe oversupply in accommodation fueling a growing rate war in Bali. Bali’s governor has had a busy week calling for the arrest and imprisonment of unlicensed tour guides and welcoming Bali’s new police chief by asking for guaranteed peace and security for the island. In order to protect traditional villages, the Denpasar government has announced it will no longer issue licenses for new mini-marts in the capital. Plans to build a new power plant in north Bali are on hold while developers try to negotiate a land price with a final landholder. Hotel news this week covers extensive management changes at the Banyan Tree Ungasan Resort and a list of gold prizewinners at the just-completed Salon Culinaire 2012 competition. Illegal villas are back in the news as the Bali Villa Association complains that most commercial villas are operating illegally. Meanwhile, the Badung regency declares it’s now the time to tear down 300 illegal villas in south Bali. 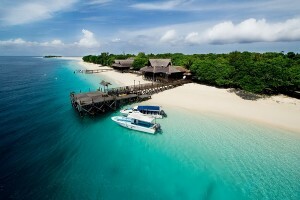 Bali Hai Cruises will suspend operations by its Aristocat from March 16-31, 2012 for docking a sail rigging. The aviation beat brings news of numerous awards being won by the national air carries Garuda; a demand by the province of Bali for a share of the profits generated by Bali’s airport; and calls for Egyptair to commence flying from Cairo to Indonesia. Ubud celebrity Janet de Neefe appears at the Melbourne Food & Wine Festival March 15-17. One night only fine dining with the wines of the Alsace from Domaine Schlumberger at the Ubud’s Mozaic Restaurant on Saturday, March 17, 2012. Friday, March 23rd is “Nyepi” Bali’s official Day of Silence. Bali Junior Golf Ballesteros Foundation Golf Tournament at Bali Handara Golf Course April 7-8. “Adi’s Art” by Adi Bachmann at Adi’s Gallery in Ubud through July 29, 2012. See the exciting video clip on "Devdan – Treasures of the Archipelago" - the latest breathtaking theatrical show opening the Nusa Dua Theatre. Support the advertisers who make Bali Update possible. Ningaloo whale shark tours to start this week!